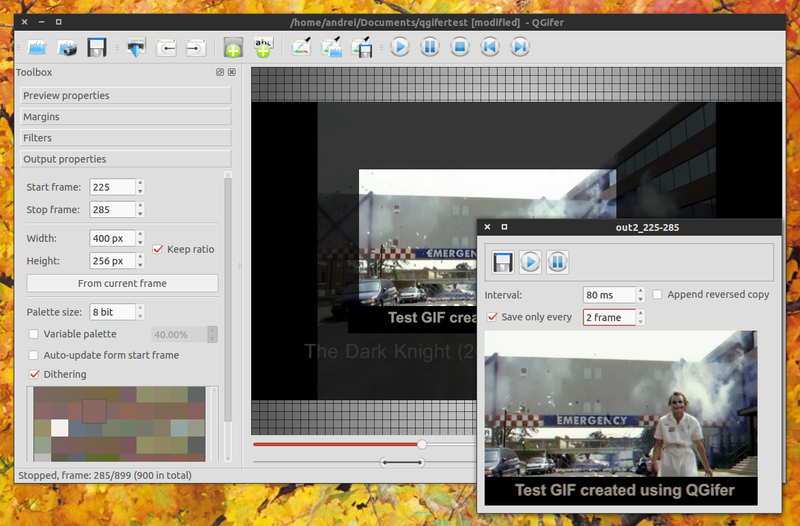 QGifer is a Qt tool available for Linux and Windows, that can convert part of a video to an animated GIF file. 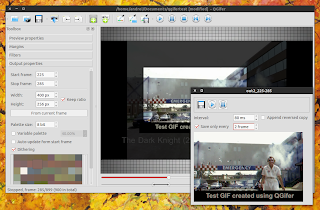 QGifer isn't just a simple video to GIF converter. Thanks to its feature set, the application feels almost like a video editor, except it doesn't produce videos but animated GIF files: you can easily set which part of the video should be used in your GIF, crop the video, add text or images, apply filters and more. Furthermore, the application comes with a GIF optimizer which you can use to reduce the file size of any GIF, not just those created using QGifer. QGifer is great but there is one downside: it doesn't support video files that come with more than 1800 frames and don't use the motion JPEG or YUV4 codecs. To be able to use these videos, you must either re-encode them using a codec like motion JPEG (the application comes with a MJPEG converter which you can access from the menu: Program > MJPEG Converter - however, in my test, this tool wasn't able to convert some videos I've downloaded from YouTube) or YUV4 or alternatively, cut the videos before importing them in QGifer. The resulting "out.avi" video should only contain the first 30 seconds from the "in.avi" video. Click HERE to see a GIF I've created using QGifer. Download QGifer - there are Windows, Ubuntu/Debian (32bit only), generic Linux binary (32bit only) and source files available. QGifer is no longer under active development however, there's a fork which comes with a few improvements and bug fixes - you can find it @ GitHub - provides 64bit binaries only (this is the package available in the main WebUpd8 PPA).